The Superbowl is next week and what is the perfect food? Chicken wings of course! This is the perfect recipe for the big game. Easy, quick and delicious. They are great for a crowd and you can make a double batch. They are sweet and spicy but you can make them as hot as you like. I, personally, only like a little spice so I left out the habanero* which is also known as Scotch Bonnets, and I added a few drops of hot sauce. 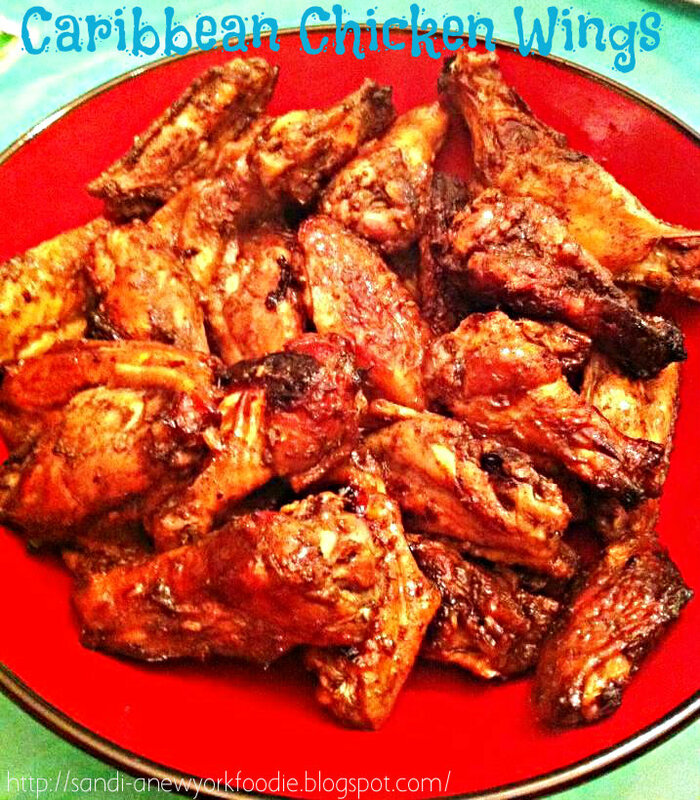 Using simple flavors of the Caribbean such as allspice, honey, lime juice, ginger and garlic, these wings are just delish! *Note: when working with habaneros or any other hot chili pepper be careful not to touch your eyes or mouth as it will burn very badly. It’s a good idea to wear latex gloves when chopping chili peppers. 1 habanero (or to taste), seeded and chopped. Preheat oven to 350 degrees F. Line 2 sheet trays with parchment. Remove chicken from bag and place on baking sheets and bake for 20 minutes. Pour marinade into a small saucepan and bring to a boil. Reduce by 1/3 until it thickens slightly; about 10 minutes. After 20 minutes, remove chicken from the oven. Brush chicken with the glaze. Raise the heat to 400 degrees F and cooked chicken until cooked through, another 20 to 30 minutes. What a great recipe! I think I have everything on hand and some wings on deck for tomorrow night! You have inspired me! Thanks for visting my blog, leaving a comment and becoming a follower. I appreciate it. I love chicken wings and I’ve seen this recipe. I may have to try this version soon. I think my SIL, Aggie, is making them today for Superbowl.